As I've gotten older, my feelings about Billy Wilder movies have changed considerably, perhaps more than any other filmmaker. I'm finding Wilder movies I didn't much care for 20 years that I now adore, and vice versa. Today, for instance, I'd argue two of his very best, critical and/or commercial disappointments then and even now greatly undervalued are Kiss Me, Stupid (1964) and Avanti! (1972). Conversely, several of his biggest successes, notably The Apartment (1960), I don't hold as highly as I once did. 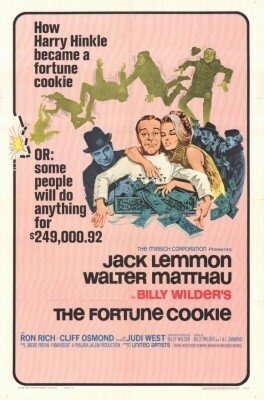 The Fortune Cookie (1966), Wilder's last big hit, falls into this latter category. Remembered primarily as the first movie to team Jack Lemmon with Walter Matthau, It was nominated for four Academy Awards, with Matthau winning an Oscar as Best Supporting Actor. At a Cleveland Browns-Minnesota Vikings game at Municipal Stadium in Cleveland, CBS sideline cameraman Harry Hinkle (Jack Lemmon) is injured when African-American star player Luther "Boom Boom" Jackson (Ron Rich) runs into him, sending Harry backwards over a large tarpaulin. He's rushed to the hospital with a mild concussion, but Harry's ambulance-chasing brother-in-law, disreputable lawyer "Whiplash Willie" Gingrich (Walter Matthau) sees a potential goldmine, especially after learning Harry had previously suffered a compressed vertebrae in a childhood accident. Harry reluctantly goes along with Willie's scheme to sue the insurance company for a million bucks. Willie sends for a paroled dentist (Ned Glass) to numb Harry's right hand and left leg, but the insurance company is suspicious, first sending their own doctors to confirm Harry's condition, and later dispatching Cleveland's best private detective, Chester Perkey (Cliff Osmond), to bug Harry's apartment and monitor his recovery, 16mm camera at the ready, from a flat across the street. Matthau had been a supporting actor in movies, usually dramas and often as the heavy, for a decade until the one-two punch of Neil Simon's The Odd Couple on Broadway in 1965 and Wilder's film made Matthau an unlikely movie star for the rest of his life. Reportedly Frank Sinatra and Jackie Gleason were considered (the latter might have been even better), but Wilder and Lemmon were sold on Matthau, sticking with him even after Matthau suffered a heart attack midway through filming, halting production for two months. (The same thing happened to Wilder with Peter Sellers on Kiss Me, Stupid, only that time Sellers was replaced.) Matthau is so colorfully lacking in scruples that he dominates the film, even over top-billed Lemmon. It's an enjoyable performance, if broad and cartoony even by Matthau's standards. Whiplash Willie is motivated solely by money, with the added benefit of sticking it to Perkey and establishment insurance types, nicely played by Harry Holcombe, Les Tremayne, and Lauren Gilbert. The basic problem with the movie is Lemmon's character. Again playing the WASP-ish everyman, Harry is a decent fellow who'd never go along with Willie's con under normal circumstances and has no interest in the payout at all. Screenwriters Wilder and I.A.L. Diamond's explanation for Harry's complicity is this: he thinks that his "injury" might bring about a reconciliation with his no-good ex-wife, Sandy (Judi West), who left him for another man. Wilder's mistake seems to have been in allowing Matthau and his character to take over, in amusing and well acted but ultimately unneeded scenes showcasing the moral depths Whiplash Willie is ready to sink to in order to win that big payoff. Though 125 minutes, The Fortune Cookie shortchanges the heart of the story: Why would Harry go along with Willie's fraud, and what will it take to turn him around? Wilder's answer provides the film's best moments, fleeting though they are, in a climax that probably surprised 1966 audiences. Without revealing too much, after two hours of mild satire, The Fortune Cookie unexpectedly becomes topical, making Boom Boom's race the deus ex machina that brings everything crashing down. Lemmon and Osmond are especially good here, but it comes so out of nowhere that, though clearly meant as a surprise, it also demonstrates the movie's basic weakness. (A sentimental, phony ending that doesn't work at all and leaves too many questions unanswered follows this scene.) Audiences should perhaps have seen it coming all along. The tensions between Harry, Boom Boom, and Sandy is where the real qualities of The Fortune Cookie lay. Whiplash Willie needs to be the engine driving the insurance story. His actions should not have been the story, with the Harry-Boom Boom-Sandy triangle an important subplot, but that's how The Fortune Cookie ended up. Despite its flaws as a movie, The Fortune Cookie is an absolute pleasure to watch on Blu-ray. Filmed in black-and-white and Panavision, the transfer is razor sharp and rich and inky with its blacks. Wilder often doesn't credit for the great cinematography in his movies (here by frequent collaborator Joseph LaShelle), but his expert framing and staging of scenes cannot be faulted. The 1.0 DTS-HD Master audio is good, and comes with optional English subtitles. Region free. Supplements are limited this time to an isolated music track and a trailer, plus Julie Kirgo's usual liner notes. . Even lesser Wilder is miles ahead of best films of most directors, and for its scintillating transfer, the performances, and aspects of the screenplay, The Fortune Cookie is definitely worth seeing. Recommended.